All window films typically have a list of ratings attached based on a variety of measurements. This is one of the most accurate ways to determine what the film will do for you once you put it on your windows. While you probably won’t know what a few of them mean, for most consumers there are only a few that are relevant and informative. Regardless, this article will help define these specs and help you understand what to look for when choosing a window film. Visible light reflectance is the amount of light reflected away by the film. This is commonly separated into interior and exterior ratings because some films have two different sides. While having a high reflectance means less light is coming in the room, many people do not want to cause too much glare. If this is the case, shoot for a medium film with a rating of about 25-30%. The remaining ratings on this list are not as crucial to choosing a film type and are generally only relevant to large commercial jobs where film stats are called out by designers. If you want to read about them anyway, you can visit our glossary page here. Visible light transmittance (VLT) and total solar energy rejected are by far the most important specs to look at. In fact, they may be the only two you will really need. VLT is just amount of LIGHT that is let in through the film. So, the lower the number, the MORE light is cut out. Many people often confuse this and think that the lower number is lighter. Total solar energy rejected is the amount of HEAT that is cut out by the film. The higher this number is, the more heat the film will stop from entering the room. If you want a film that cuts out the most light and heat, choose one with a very low VLT (around 5-15%) and a very high total solar energy rejected (around 80-85%). To allow more light and heat in, choose on with a VLT of 25-35% and a total solar energy rejected of about 65-70%. 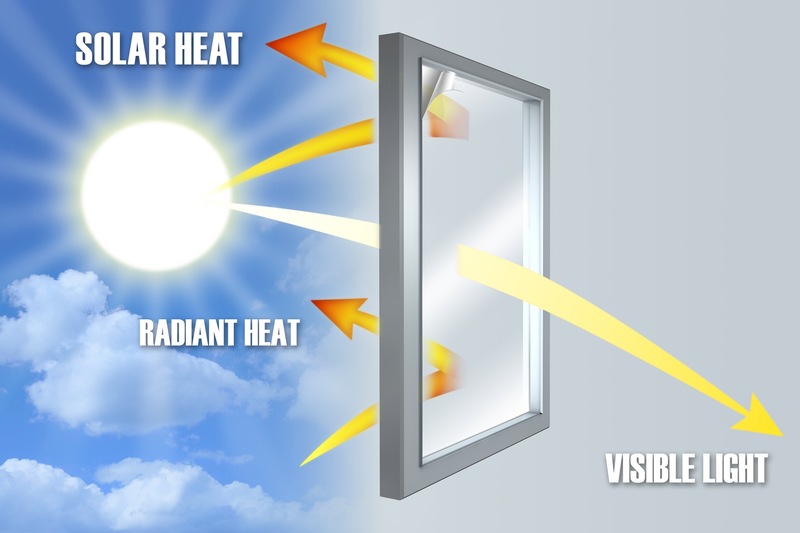 Heat can do three things once it hits your window: it can pass through into the room, it can be reflected away, or it can be absorbed by the glass. So, total solar transmittance is the amount of heat that the film will let through the glass into the room. Total solar reflectance is the amount of light reflected away by the film. And finally, total solar absorbance is the amount of heat absorbed by the film itself. For transmittance and absorbance, you usually want the lowest number possible. This will allow your room to be as cool as possible since the heat is not absorbed or transmitted. As far as reflectance, a higher number is preferred is you want to cut out as much heat as possible.